*If your name appeared twice, you were only counted once. *If you left me a comment on my "Podbean" site, you were added to the end of the list here. Congratulations!! Please send me you mailing information via email so that I can get your fabric and fiber goodness out to you. Thanks to all who left knitting and quilting tips and thanks for playing. Winners will be announced "New Year's Eve"! It is here! Boxing Day Sew In! Join us on Twitter with hash tag #BDSI. My immediate focus for today is quilting my Arabesque wallhanging and piecing my Stretched Star pattern. All else will be, as they say, icing on the cake. The give away will be drawn, using the random number generator, sometime on New Year's eve. See you on Twitter and happy sewing. Progress pics to follow in another post. Join the fun! Just completed a top inspired by "Jelly Roll Race" quilt. I started it this morning. Will have to say, it went together pretty quickly. If you need a quick project, this is it. This is what I started with. This is the completed top. Ready for batting, backing and binding. I call it "Midnight at the Races". Stay tuned!!!!! 1930's BOM that I completed, almost. Red &Green Applique-already pin basted and ready for quilting! TX Blue Bonnets in Purple. This is some of my earlier applique and piecing. My very timely find was this mini Snowman Quilt w/beading. This was another 1st for me. My instant gratification project, the Fabric Bowl! Sushi @ Christmas top is complete! I think I'll stop now with the finds. I have several more to talk about, but I shall save some for another time. TQP#10 is recorded and available on ITunes. Is anyone else having problems getting in the holiday spirit? Or is it just me. This is my favorite time of year, however, I can't seem to get into the spirit. I have my holiday music blasting in my car and at work hoping it will get me there. I took my tree out of storage yesterday, but it still remains in the bag today. I did muster up the strength to put out my "Snowman" flag and hand my holiday wreath on the front door. In just 14 days, Christmas will be here. Will I be ready. No I am not depressed, but just not in the spirit at this time. If you need a quick gift, do I have a link for you. A must see tutorials by Jenni of the MSQCo - Christmas Tree Skirt from 2 Charm packs. Take a look! Something I would like to focus on, FMQ Challenge 2012. I hope to improve FMQ'ing so that I can quilt the tops that I piece. I want to be able to take what design is in my head to my finger tips, and end up on a quilt top that I pieced. Then I can say, I made that quilt from start to finish. Once I can accomplish that, then the next step is design! I am planning to organize my time, stash and my work spaces. I would love to be able to finish more quilts. Right now I am in the "top" phase. I would like to be in the running with those who complete from start to finish. Check out these book raves: Quilters Academy Vol. 1 & 2, by Harriet Hargrave and Carrie Hargrave, Posh Pocket Tips for Quilters, Posh Pocket Tips for Knitters. I am finding them very informative. Last but not least, I have finished 75% of the "Thermis" neck warmer for my sister. It's time to start thinking of buttons. It should be completed by the weekend. Episode #8 is out. I hope the sound quality is better. Thanks to all who are sticking with me! As I mentioned in a previous podcast, I went out of town during the Thanksgiving holiday to assist my sister after her surgery. I want to thank the listeners that sent out well wishes to her. You know who you are. Just to update you, she is doing well, using her cane vs her walker and getting up and down the stairs without any assistance. While I was on my mini vay-cay, is that a word, I planned to focus on my knitting. It was portable and took up less space in my suitcase and my vehicle. Well, all I took with me was knitting, no quilting items. I was at my sister's all of 1 1/2 days, I wanted to quilt. I was told by my sister that she had a sewing machine. Excitement, you can't imagine how excited I was. My sister doesn't sew!! So, she told me she wanted me to fix a seam in 2 pairs of her pants. I said,ok. I went to get the machine out of hiding and to my surprise, this is what I found. I sooooo wanted to quilt. I took the machine, no foot pedal, however there was a "start/stop" button. At my finger tips, I had the ability to sew a straight stitch only. So, I decided to go to a big box store to buy some inexpensive fabric, small cutting mat and rotary cutter to play with. A coupon was involved of course. I figured crumb blocks of sorts would be best. I could make my seam 1/4" using the rotary cutter! Here's what I did. Not to bad for a desperate quilter. Well, you are not in you local area, you must visit LQS's and LYS's. I did just that. I went to Fabric Hut, also an online shop I order from, in Norfolk, VA. Purchased the Accuquilt Go-Snowman and Batiks there. Also, I visited Nancy's Calico Patch in Newport News, VA and purchased more Batiks and Aurifil thread for piecing. Her shop is an authorized Bernina Dealer. I toyed with the idea of purchasing a Bernett 46, however, I talked myself out of that. This would be a perfect machine for a very young person that has interest in sewing. Progressing nicely on my Weekend Shawl. I am now on the Sunday pattern repeat! Ten rows to go. Completed a couple of knitting projects while there! I stared another cowl for my sister, at her request. I just love how people say, "can you make me one?" Her color choice is a "neutral/beige". 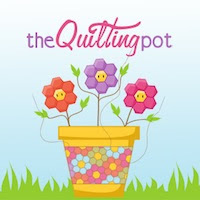 On my 2+ hour drive home, I caught up on "Quilting for the Rest of Us" podcast, episodes 67-69 and a portion of 70. Listening made the drive home a lot easier. BTW, haven't started my BOM project yet...there was a little bump in the road in my plans!!! Stay tuned!